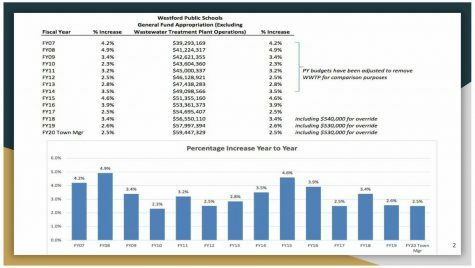 Faced with a 1.6% budget increase for fiscal year 2020 as opposed to the 3.3% required to carry forward existing education services, Westford Public Schools has proposed $1.2 million of budget cuts in order to make ends meet. Superintendent Everett Olsen, who initially requested a 4.6% increase to cover additional improvements and costs, presented the program cuts at the Jan. 28 School Committee Meeting after weeks of consideration with various town committees, but no decisions were made. The cuts will be finalized at the Mar. 23 Town Meeting. “The difficulty we are facing is that our costs are rising faster than our resources,” summarized School Committee member Gloria Miller. The cuts, organized into three tiers of increasing priority for re-institution in future years, include the removal of 21 full-time positions. The FY19 and FY20 budget increases were both under 2% discounting the tax override for teacher salaries, the only ones that low in the town’s recent history. 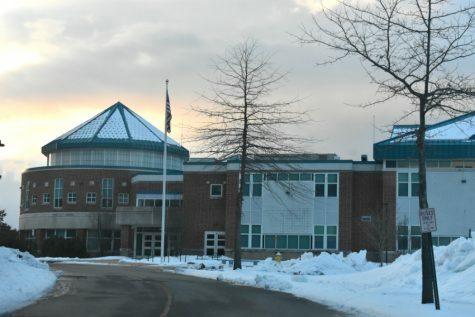 Westford Academy’s population, filled to capacity with 1,716 students, led to most of the reductions occurring at the elementary schools, with the removal of two middle school teachers, six teaching assistants at the K-2 level, four full-time and one part-time Digital Learning Specialists, and the Pre-First Program as only the most notable of the cuts. The most significant changes at Westford Academy include a one-third cut in substitute teachers, a raise in the activity fee required to participate in clubs from $60 to $100, and a reduction of one full-time teacher. 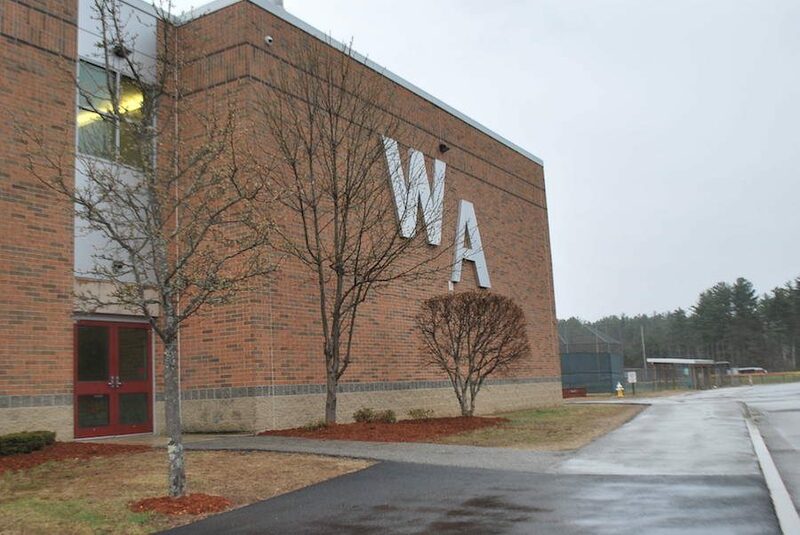 The activity fee hike may come with a decrease in clubs at WA; according to Olsen’s Jan. 10 presentation to the School Committee, “the wide variety of club offerings may be reduced.” The teacher reduction will occur based on enrollment levels after students choose their 2019-2020 classes in February, said Principal James Antonelli. The budget for paying substitute teachers has been cut from $45,000 to $30,000, and will continue to decrease over future years. Training is in progress to establish a Google Classroom-based system where students will be sent to the lecture hall or the library in order to complete work online under adult supervision. This independent work will occur mainly when teachers have planned absences, but will expand to include all absences in future years. The problem, however, is once again the student population. “If we have a lot of teachers out one day, our lecture hall can’t hold that many that many students. […] So we’ll have to cross that bridge to see how it goes,” said Antonelli, who believes implementing the Google Classroom system will be bumpy at first but that students and faculty will adjust as time goes on. He also notes that the teachers’ updated contract allows them to supervise other classes during their prep periods for $15 a period, another potential avenue to alleviate the lack of substitute teachers. A proposition for a later start time at the high school and middle schools, for which the School Committee has long since been advocating, has been swept off the table due to its $148,000 burden from additional Special Education bus costs. Westford Academy has one of the earliest start times in the area, beating out competitive schools like Newton, Acton-Boxborough, and Concord-Carlisle with its 7:35 opening. A comparison of Westford’s start times with those of nearby towns. While costly in the moment, School Committee member Megan Eckroth stresses the importance of considering the long-term benefits for student health of changing the start time. The School Committee plans to continue to push for the change for FY21. “I think it’s very easy for people to say ‘we’ve been operating this way for a long time, and we’ll be fine.’ But this is a huge benefit with a relatively small change. […] I think that the immediate benefits will certainly be evident in high schoolers, and potentially middle schoolers. But the long term benefit for people to understand is that all of your students will one day be that age,” Eckroth said. Many of the reductions, especially at the lower levels, are based on decreasing enrollment; while three out of four WA classes cross 400 students, none eclipse that number in kindergarten through grade seven. However, this relief is expected to be offset by the introduction of 647 residential units into Westford, the town’s largest population increase since the 1980s. Olsen added in his Jan. 10 presentation that the Planning Board indicated that 82 more units may be in development. This growth prompted a larger budget increase recommendation for public safety services by the Board of Selectmen rather than for the school system. “I think the problem this year is there’s really a disconnect between how they [the Board] want to address growth and how the superintendent and the School Committee would like to address growth,” Miller said. Once the enrollment increases are finalized, Olsen has an agreement with the town government to fund the necessary hires, but that does not mean the town’s budget issue will simply disappear. While some costs can be offset through unused money from electricity and heat budgets or cash reserves, with rising costs and unpredictable state funding, more cuts may being coming WPS’ way unless residents get involved in town government. The Rita E. Miller Elementary School, which educates students from kindergarten to second grade. As long as WPS is working fervently to maintain components of its school system, such as low student-to-teacher ratios and various enrichment opportunities, there is no possibility for new initiatives, says Miller. “If we’re constantly treading water, we can’t undertake anything new,” she said. Next on the chopping block may be certain electives at WA, especially if enrollment does decrease in future years. In addition, programs that are removed will take years of advocacy to reinstate even if funds return, says Antonelli. It will take an economic resurgence and increased state funding to halt the constant money drain on the town and thereby the schools. “We’ve got a good economy going on right now. I’m cautiously optimistic that we’re going to get some new revenue in the community of Westford and stop the bleeding on these cuts. We can’t continue to go on this particular road, because if we do, we will continue to dismantle everything we worked hard to build,” Antonelli said. Eckroth maintains that the immense contribution of the Westford schools’ excellence to the town means that investing in the school system now will pay off later, whether it is maintaining support in the elementary levels or making the start time change at the middle and high schools. “Things can hurt in the moment, and it is hurting at the moment for all of us. And these are difficult decisions, but I think that part of an effective School Committee and an effective administration is looking five, ten years down the road at the ever-evolving thing that is public education,” Eckroth said.